Conclusion – Will The Peavey JF-1 Work For You? A good electric guitar will provide a musician with incredible sound, tone, and control over their music in addition to looking impressive during a performance. In order to really express yourself through your instrument and to get the one that will best meet your needs, you need to make sure that you buy a high-quality guitar designed not only to feel great during play but also to provide rich sounds and clear notes. As expected, there’s an incredible range of options when looking for an electric guitar, which means that it can get a little overwhelming when shopping. However, buying from Peavey has never been a mistake, and if you are in the market for an affordable guitar that is packed with features while still being very easy to use, then the Peavey JF-1 may be one for you to consider. This electric guitar is as powerful as it is attractive, loaded with features, and offers a clear and clean sound, no matter the skill level of the musicians wielding it. Before shopping and spending hundreds of dollars on an electric guitar that simply may not meet your needs, you need to make sure that you educate yourself so you can choose the best option for you. By learning all that you can about the Peavey JF-1, you will be able to make an informed decision about whether or not it is the right choice for you. Keep reading to find out more so that you can choose the best electric guitar for your needs. Unlike acoustic guitars, electric guitars are going to offer a lot more power, as well as deeper and richer sound, which is why they are so popular for live music. This guitar is a great option for any musician who records, performs live, or even wants to be able to practice at home without sacrificing great sound quality. This guitar is ideal for jazz or fusion players who are going to be moving their hands on the fretboard while playing and need to be able to move quickly and without getting snagged or otherwise delayed. Because Peavey knows that the Peavey JF-1 appeals to fast-playing jazz musicians, they angled the neck just a little bit. This makes it even easier for the musician to have full control over the neck without having to get into an uncomfortable position. While designed to allow for fast rifts and original tunes during jazz sessions, the Peavey JF-1 is also great for any musician who simply wants to improve their ability. It’s best for a beginner or intermediate player who is just learning how to really control the sound that their instrument makes. Professionals may get frustrated because some of the components on this guitar aren’t incredibly high-quality and will need to be replaced for best sound quality. Examples include the tuners and nut. Like most electric guitars, this one from Peavey ships by itself. This means that there aren’t any of the accessories that you traditionally use with a guitar, such as a pick, capo, strap, or the amp or cords. Most musicians will have these accessories already on hand, which means that they can get started playing right away possible. This guitar is designed to be very easy for a beginning guitarist to use, but that doesn’t mean that Peavey has skimped on providing quality features to make the instrument a great option for slightly more advanced players. The fast neck on this guitar is what makes it really stand out and makes it play more like a Les Paul, which allows for incredibly fast rifts without mistakes. With the fast action on this guitar combined with the clear intonation, it’s easy to see how it stands out in a crowd, which is great for musicians who want to be able to perform a solo with their band. 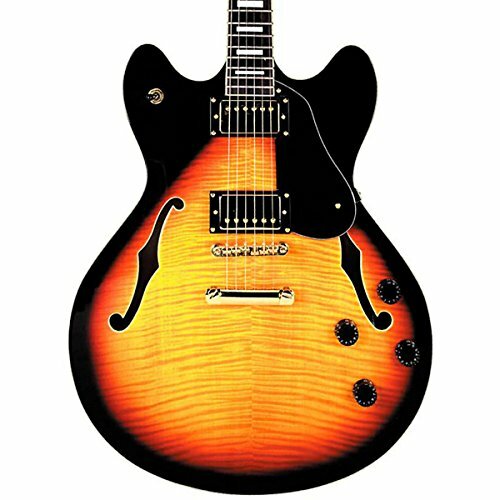 Even though there are many hollow and semi-hollow electric guitars that produce a lot of feedback, this is not one of them. Thanks to the great sustain and clear sound, musicians don’t need to worry about a lot of annoying feedback. One additional feature that beginners are sure to appreciate with this guitar is not only how easy it is tuned, but how well it holds its tune. It’s really frustrating for beginners to try to fight with their instruments to keep them in tune day after day, but the Peavey JF-1 tunes easily and then stays in tune, which allows musicians to enjoy regular practice and performance without worrying about whether or not they are in tune. If you aren’t convinced that the Peavey JF-1 is right for you then you may want to consider the Ibanez Artcore AS73 guitar. Not only has this guitar been designed so that musicians can easily reach the higher notes on the neck, but the pickups are designed to produce a warm and balanced sound. Additionally, it features incredible response, and since it is priced a little lower, is a good option for people who are on a budget and want a quality guitar without overspending. 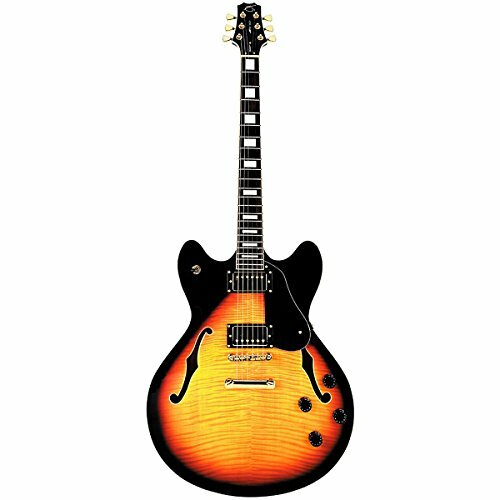 While the Peavey JF-1 is perfect for beginners, the Ibanez is a good alternative to consider. It’s easy to see how guitarists will be able to coax great sound and tone quality from the Peavey JF-1. This electric guitar was designed to be the perfect balance of style and function, and it will meet the needs of many new musicians. While there are many electric guitars on the market that are designed for easy playing, fast fingerwork, and plug-and-play availability, this guitar from Peavey is high-quality and built to last. Being able to use this guitar both in practice and in live performance will help you improve your tone and give you confidence. When you choose the Peavey JF-1, you will be able to coax great sound from your instrument, no matter how high on the neck you go, without sacrificing richness and depth of sound.